The decision has been made – David Lawrence will be the new library director after Margaretha Grahn, who is retiring. And he is looking forward to being part of the journey towards a more digital library in the new student building at Campus Valla. David Lawrence is not a totally unknown figure at LiU. He studied civil engineering and was appointed associate professor in chemical engineering, starting to work at the Department of Physics, Chemistry and Biology in 1999. He moved to the library in 2006 as scientific editor with Linköping University Electronic Press, and since 2009 he has been head of the Department for Publishing Infrastructure (PI). Why did you apply for the job as library director? “I have become increasingly interested in ensuring that the library maintains a comprehensive way of working, and I have become increasingly involved in this work. Digital operations have increased, and the support we give to researchers is increasing and becoming an evermore important question. The role of the library in the university has changed, and is very different now from what it was only ten years ago. David Lawrence doesn’t mean that the whole library is to be digital, of course: the physical library is very important. “It must be a living location, somewhere to study, a place for researcher meetings, a multidisciplinary space. This is why it will be exciting to move into the new student building at Campus Valla and take part in the process. I look forward to being able to make a difference. You’re going to become the head of people who have been colleagues. How do you view this? 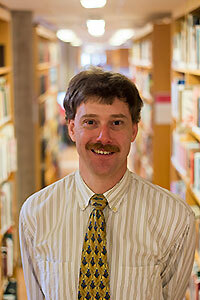 “The climate at the library is extremely collegial, so I don’t see it as a problem. I’m not the sort of head who must keep control of small details: I will try to create the conditions required for department heads and those responsible for certain fields to use their expertise and do their jobs in the best way possible. So when do you formally start work? How did you celebrate when you got the news? “The recruitment process started in August, and it was about 10 days ago that Roger Klinth, who is chairperson of the library board, called and said that the appointments group had placed me as first-choice candidate. But I didn’t celebrate with champagne – we had Halloween cake instead! I have four children at home aged between one and seven, so there’s plenty going on there, as well. Roger Klinth is deputy vice-chancellor for education and chairperson of the library board. He has led the recruitment process for the new library director. “Twelve people applied for the post, which was an open recruitment with many excellent candidates. We interviewed six of them: two of these were already employed at LiU while four were external candidates. And David Lawrence was the applicant who most clearly matched the qualification requirements that were specified in the employment profile. We were looking for a person who not only has massive experience and knowledge of the university as an organisation and of the library in particular, but who also will be able to lead a process of change and be a pathfinder on our journey to become a modern library.